Marines assigned to the 15th Marine Expeditionary Unit wait for clearance to depart the amphibious transport dock ship USS San Diego (LPD 22) in an upgraded amphibious assault vehicle during Certification Exercise (CERTEX). San Diego is currently underway conducting CERTEX as part of the third and final phase of qualifications for their upcoming deployment. 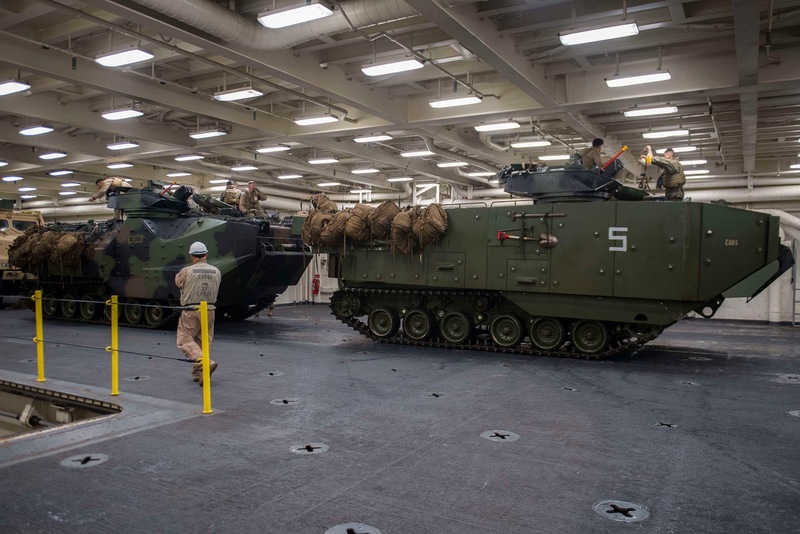 The America Amphibious Ready Group is comprised of more than 1,800 Sailors and 2,600 Marines assigned to the amphibious assault ship USS America (LHA 6), the amphibious dock landing ship USS Pearl Harbor (LSD 52), and San Diego. Caught this pic on my feed alerts and did a double take. That looks like the AAV-SU! It's already hitting the fleet? Are they testing it on the run? Uh. Wow. This is ... unusual. Is the AAV-SU being considered an "urgent requirement"?